AARNet, Australia?s National Research and Education Network, enables Australian research and education institutions to collaborate with the rest of the world and participate at the edge of discovery. Chris Hancock will talk about how, in an increasingly globalised world, AARNet?s network and services are evolving to meet the future needs of the research and education sectors on a global scale. Chris Hancock Chris Hancock is Chief Executive Officer of AARNet, a position he has held since 2004. He came to the role with 25 years executive leadership experience, including 15 years in the media and telecommunications sectors. As CEO, Chris has overseen extraordinary growth. 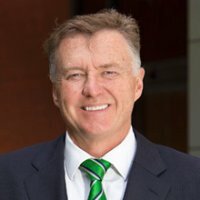 Under his leadership, AARNet has developed one of the largest network footprints in the world and today, serves 38 Australian universities and the CSIRO, as well as many health and other research organisations, schools, vocational training institutions, cultural organisations and specialist content providers. More than one million people now access the network for teaching, learning and research, connecting with each other and their peers around the world. Prior to joining AARNet, Chris held several key executive positions at Optus, including Managing Director, Optus Wholesale and Managing Director, Optus Business. He was an integral member of the senior executive team that completed the initial public offering and subsequent sale of Optus to Singtel.